Free Shipping on $75 from DiscoveryStore.com! Shop for Telescopes, DVDs, and Toys ! Soyuz Taxi Flight 5 has returned from the ISS. LEFT: (L-R) Flight Engineer Yuri Lonchakov, Commander Sergei Zalyotin, and Flight Engineer Frank De Winne. RIGHT: ESA logo for Odissea mission. A taxi flight crew has delivered a new Soyuz crew return vehicle to the International Space Station. Soyuz 5 Commander Sergei Zalyotin and Flight Engineers Frank DeWinne and Yuri Lonchakov launched in the modified Soyuz TMA-1 spacecraft at 9:11 p.m. CST Oct. 29 (0311 GMT Oct. 30) from Baikonur Cosmodrome, Kazakhstan, and docked with the station at 11:01 p.m. CST Oct. 31 (0501 GMT Nov. 1). They will spend eight days at the station conducting science investigations before returning to Earth in the Soyuz TM-34 currently docked with the station. 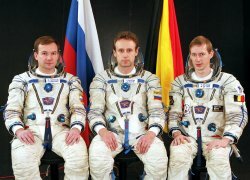 Zalyotin and Lonchakov are cosmonauts with Rosaviakosmos, the Russian Aviation and Space Agency. DeWinne is a European Space Agency Astronaut from Belgium. This will be first flight to the station for Zalyotin and DeWinne. Lonchakov visited the station as a member of the STS-100 crew in April 2001. 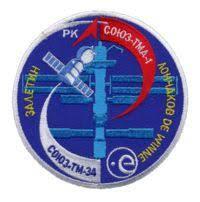 Russian flight rules dictate that a Soyuz remains docked to the ISS and replaced by a fresh Soyuz every six months. 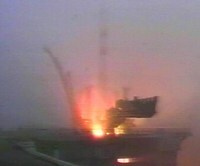 Should the station's resident crew encounter an emergency requiring them to disembark the orbital outpost, they would enter the Soyuz lifeboat, undock from the station and de-orbit for a landing on Earth. The Russian spacecraft is certified to remain in space no longer than six months due to the degradation of its propellant over time and space radiation hazards to the vehicle.